First National Bank in Forest Hill, Maryland offers an array of banking services and solutions designed to conveniently serve you. Our dependable team members are ready to assist you with all your banking needs. Visit this branch at 2105 Rock Spring Rd or give us a call today at 410-838-3600 to learn more about our full range of commercial banking, consumer banking and wealth management solutions. 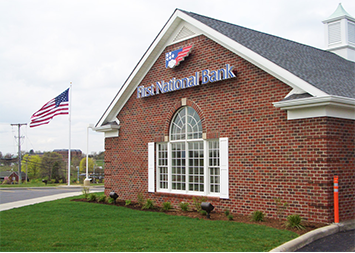 This First National Bank branch in Forest Hill, MD is located at 2105 Rock Spring Rd, and offers a 24-hour ATM for your convenience. For help with any of your banking needs, please stop in during normal business hours and speak to one of our friendly team members. Need after-hours banking? Access our ATM to make deposits, withdraw cash or check your balance. Founded in 1864, FNB provides a full range of commercial banking, consumer banking and wealth management solutions. If you are coming from near Whispering Woods, MD, head south on Old Rocks Rd and turn right onto Coen Rd. Turn left onto MD-24 S and continue for 6.2 miles. Arrive at First National Bank (2105 Rock Spring Rd, Forest Hill, MD 21050). If you are coming from near Pleasant Hills, MD, head north on Pleasant Hills Rd toward Karylou Dr and continue onto Wilgis Rd. Turn right onto US-1 N/Belair Rd and continue for 5.3 miles. Exit onto MD-24 N/Rock Spring Rd toward Forest Hill/Rocks and continue for 2.1 miles. Arrive at First National Bank (2105 Rock Spring Rd, Forest Hill, MD 21050). If you are coming from near Churchville, MD, head south on MD-155 W and turn right onto MD-22 W. After 2.2 miles turn right onto Prospect Mill Rd and take the 1st exit at the traffic circle to stay on Prospect Mill Rd. Turn right onto MD-543 N/N Fountain Green Rd and use the left 2 lanes to turn left onto Hickory Bypass. Turn right at the 1st cross street onto MD-23 W and continue straight at the traffic circle to stay on MD-23 W. After 0.9 miles turn left onto Rock Spring Rd. Arrive at First National Bank (2105 Rock Spring Rd, Forest Hill, MD 21050). If you are coming from near Taylor, MD, head northeast on MD-146 N toward Pocock Rd for 1.1 miles and turn right onto MD-152 S. Turn left onto Furnace Rd and after 1.3 miles turn left again to stay on Furnace Rd. Turn left onto MD-165 N and then turn right onto MD-23 E. After 4.8 miles, turn right onto Rock Spring Rd. Arrive at First National Bank (2105 Rock Spring Rd, Forest Hill, MD 21050).